Custom Medical Emergency -Pocket First Aid Kits Personalized in Bulk. Economy, Promotional, Recycled. Budget Prices in America. Bulk recycled first aid kit, custom imprinted with your logo or message . The pocket first aid kit consists of a durable hinge box that contains six adhesive bandages, five junior bandages, three antiseptic towelettes, extra large bandage and a first aid card. Our promotional, nature friendly first aid kits are molded from 100% recycled, biodegradable plastic material. We also supply wholesale blank (not imprinted) recycled first aid kits for $1.60 each. Budget Prices in the USA and Canada for wholesale recycled first aid kits. American clients pay no taxes, Canadian clients don't pay PST. We will send you a proof for your approval before production. Multi-color Imprints: Minimum for 3-4c imprint is 1000. Setup Charge is $40.00 per color. You may order any in-between quantity; assortment of colors is allowed. 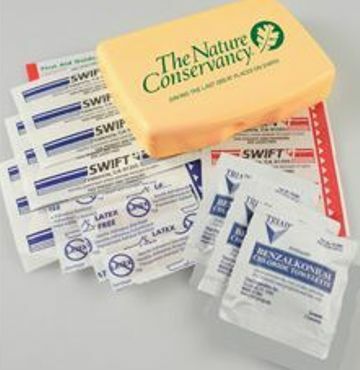 We also supply wholesale blank (not imprinted) recycled first aid kits for $1.60 each. Production Time: 7 days after art approval; Rush Production of 3 days: add $0.35 per first aid kit. Blank first aid kits ship next day. Product Size: 3 1/8" x 4 1/4" x 7/8"
Imprint Area: 1 7/8" x 3 1/2"
Colors: Black, Eco Dark Green, Eco Navy Blue, Eco Tan, Eco Gray (see picture). Standard Production Time: 7 working days after art approval; Rush Production of 3 days: add $0.35 per eco-friendly pocket first aid kit.